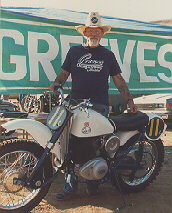 My passion for Greeves motorcycles has been with me for over forty years. If I can pass on any pearls of wisdom or assist you in any manner, please feel free to call. Note however, that I do not have an answering machine, so you may have to be persistent. Let the phone ring - the shop can get noisy. If you do call, realize we're out here in California, so pick a decent time of the day. You can also email me at ---. However, if you expect a long answer in return, you'll be disappointed. I'm a lousy typist with little patience for hunting and pecking at the keyboard. I'd much rather spend my time in the workshop. If your are looking for a parts quote, please fill out and submit the form at the bottom of the "Products" page.